The HITS Culpeper Show Series wrapped up at Commonwealth Park in Culpeper, Virginia with the Culpeper finals, held September 28th - October 2nd. It was a great finish to the season with picture perfect weather and a number of special classes and events throughout the week. On Saturday morning, Boehringer Ingelheim sponsored an exhibitor breakfast to kick off the day. Complimentary breakfast including hot coffee, French toast, and chocolate chip cookies were served accompanied by plenty of swag from Boehringer Ingelheim. 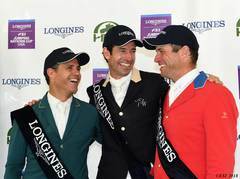 On Sunday, prior to the $25,000 HITS Grand Prix, the Horseware Ireland Grand Circuit Champions were crowned. The top finishers in over 100 divisions throughout the season were presented with a tricolor ribbon and an embroidered cooler courtesy of Horseware Ireland. Boehringer Ingelheim handing out swag at our Exhibitor Party. The Open Jumper divison features three classes each week, and Tracy Magness pulled off a hat trick for the week, winning all three. Magness and INTENZ VAN HD won the $5,000 Open Welcome on Wednesday, the $15,000 Johnson Horse Transportation Prix on Friday, and wrapping up the week with a win in the $25,000 HITS Grand Prix on Sunday. Magness was the only rider to go double clear in the $5,000 Open Welcome on Wednesday, with a Jump-Off time of 44.822. In the $15,000 Johnson Horse Transportation Prix, this team was one of five to make it to the Jump-Off. Coming back second to last, in the Jump-Off and the first three riders having all jumped clear, Magness knew she would have to be fast and clean in order to take home the win. Nearly a second faster than the second place, Marylisa Leffler and BLING BLING, Magness won the class with a time of 34.403. Brooke Kemper and CLASSIFIED finished in third place. Of the three that jumped clear in the first round of Sunday’s $25,000 HITS Grand Prix, Magness and INTENZ VAN HD were almost two seconds faster than CLASSIFIED and Brooke Kemper who took home the second place award. Third and final to Jump-Off was Dundee and Richard McGrath completing the Jump-Off. Tracy Magness and INTENZ VAN HD after winning the $25,000 HITS Grand Prix on Sunday. GUIDANCE and Katlynn Bulter took home the blue ribbon in the $2,500 Junior/Amateur-Owner Jumper 1.20m Classic. They were the only team to go double clear with a Jump-Off time of 44.201. In second was CARIVEL, ridden by Andrea Smith, with 4 faults and a time of 39.675. Third place was awarded to WALKING TALL and Ginny Gale. In the $5,000 Pyranha Junior/Amateur-Owner Jumper 1.30m Classic, ROCKEFELLER Z and Shelly Zimmerli took home top honors with a double clear ride in 36.044 – almost five seconds faster than the second place winner. The red ribbon was awarded to KIRIN, ridden by Kate Paige, with a Jump-Off time of 40.469. Third place went to HIGH TIDE and Abigale Frye, with 4 faults and a time of 39.351 in the Jump-Off. The last of the Junior/Amateur-Owner Jumper Classics on Sunday was won by RAVENNA ADELHEID Z and Tamara Morse. Morse and her partner were the only competitors to make it back to the Jump-Off in the $7,500 Junior/Amateur-Owner 1.40m Jumper Classic. In second were HABSBURG 2 and Felicia Russell, followed by COQUETTE, ridden by Hanna Toering. The $2,000 Marshall & Sterling Children’s/Adult Jumper Classic was won by AMALEE and Jessica Matelis. This team went double clear and had a time of 36.836 in the Jump-Off. The red ribbon was taken home by Mary McDaniel and her partner LADDY BOY who also went double clear, but with a time of 37.679. Rounding out the top three were INDY and Dawn Vileno – double clear with a time of 37.800. RIBOTEUR and Brenna Magness rode to a first place finish in the Low Children’s/Adult Jumper Classic as the only pair to go clean in the first round of the class. In second, with 4 faults, was BILLY BAROO, ridden by Emily Williams. Third place honors were awarded to BY DESIGN and Rhoni Rakos. Taking home top honors in the $2,500 Devoucoux Hunter Prix was EROS SCF ridden by Gavin Moylan with a two round total of 154. In second, with a two round total of 148, were LUNETTA and Grace Long and in third was SALINGER ridden to a combined score of 147 by Amy Zettler. The $1,000 Amateur-Owner Hunter Classic was won by FABRIANO and Jan Bitzberger with a two round total of 166. In second place was HEARTTHROB, ridden by Laura Schroff Scaletti to a combined score of 163, while Martine Hartogensis rode to a third place finish with a score of 159. On top of the standings in the $1,000 CWD Junior Hunter Classic was EVERGLOW and Katherine Dash with a two round total of 169. Dash also took home the white ribbon aboard CATIRA. In second, with a combined score of 162, were RONALDO and Danny Mahon. On Saturday, Danny Mahon and her other partner CHOPPER 5 claimed top honors in the Culpeper Equitation Classic. Third place in the Junior Hunter Classic went to Claire Parkinson and CHAZEAUX scoring a 160. The $1,000 Marshall & Sterling Adult Hunter Classic was won by rider Lindsay Cook and her partner CAMILLE with a combined score of 161. Taking home both second and third place honors was Patti Schindler. Schindler scored a two round total of 159 aboard GLYNDON, for second place and a combined score of 152 with PINCH HIT for third. A two round total of 164 would secure the blue ribbon for GOSSIP GIRL and Katie Triantos in the $1,000 Marshall & Sterling Children’s Hunter Classic. Second place was awarded to Nicole Butchko and her partner CORSAIR, scoring a 152 between their two rounds. Rounding out the top three was Addy Wingate and ROSEHAVEN LEGACY with a two round total of 151. In the $1,000 Perfect Products Pony Hunter Classic, Katie Triantos claimed another blue ribbon, this time with ROYAL FLUSH. This team had a combined score of 168 and the highest scored in each of their rounds. Second place honors went to COLERIDGE and Jordan Toering with a combined score of 166, and ECLIPSE and Julia Zug came in third with two round total of 161. Top honors in the $500 Neue Scheule Bit O’ Straw Hunter Classic, went to DEEP BLUE SEA and Grace Theurich riding to a two round total of 158. Just behind Theurich, with a two round total of 153, was JUST FOR FUN ridden by Catherine Clisham. Third place was awarded to SAYER and Claire McMahon, who had a combined score of 149. Mr. and Mrs. Gavin Moylan pictured after a win on EROS SCF in the $2,500 Devoucoux Hunter Prix. HITS Culpeper will return with six weeks in April of 2018 in the heart of Virginia’s Horse Country. Visit HitsShows.com for our 2018 HITS Culpeper dates. We look forward to you joining us again next year!